Since CRJ has normally met on the first Sunday of the month and we have reported that, we wanted to get this announcement out before tomorrow in case someone thought the meeting would be taking place tomorrow. CRJ originated in response to a single disturbing racial incident. Steering Committee consists of parents of Santa Monica students, community members and clergy. CRJ membership is open to all. We welcome all people of good will to attend our workshops and join our working committees. CRJ has been active in 3 main arenas. embedded in the systems by which our society is organized. It manifests itself, for instance, in segregated housing patterns, in enormous racial disparities in our distribution of wealth, in the use of predominantly Eurocentric materials in our history classes, in racially discriminatory policing, etc. The study of race and racism is multi-disciplinary, involving the fields of history, sociology, political science, psychology, economics, religion, literature and other arts, and more. There is so much to learn! Hence, our monthly educational workshops, which typically feature noted guest speakers, as well as time for discussion and dialogue. And of course, there is so much to do to undo racism. A regular feature of our workshops, therefore, is to inform our attendees of a variety of opportunities for action. Second, CRJ works continuously to advocate for Black students in the Santa Monica/Malibu Unified School District. We persistently push for policies and practices that will benefit Black students. We do not espouse “colorblindness.” We believe Black students face specific challenges in this society, which is so pervaded by racism, and we believe, accordingly, that they deserve various kinds of support that are designed especially for them. For example, we believe that they deserve courses that are specifically about Black history and culture, as opposed to mere equal access to predominantly Eurocentric courses. It is worth noting that CRJ avoids a binary approach to thinking about race. We do not, for instance, divide individuals simply into racists and non-racists. Instead we recognize that we are all at some point on a continuum. Similarly we see institutions like the Santa Monica schools as being at some point on a continuum. Our goal is to push them to the highest point possible. 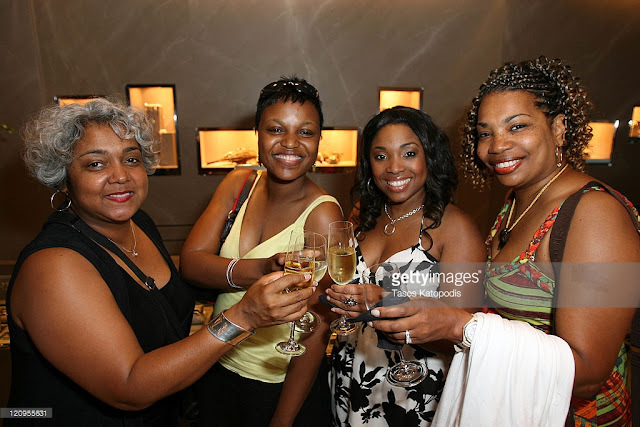 We believe that not only Black students but all students will benefit enormously as a result. CRJ has created a document called “A Vision for Schools where Black Lives Matter” to guide us in this work. During the 2017-2018 school year we will be campaigning specifically to establish a support group for the parents, grandparents and guardians of Black students for every school in the district. Third, CRJ works to oppose many forms of injustice in the nation’s criminal justice system: racial profiling and race-based harassment, excessively harsh sentencing laws, mass incarceration, police shootings of Black citizens, discrimination against individuals exiting incarceration, etc. 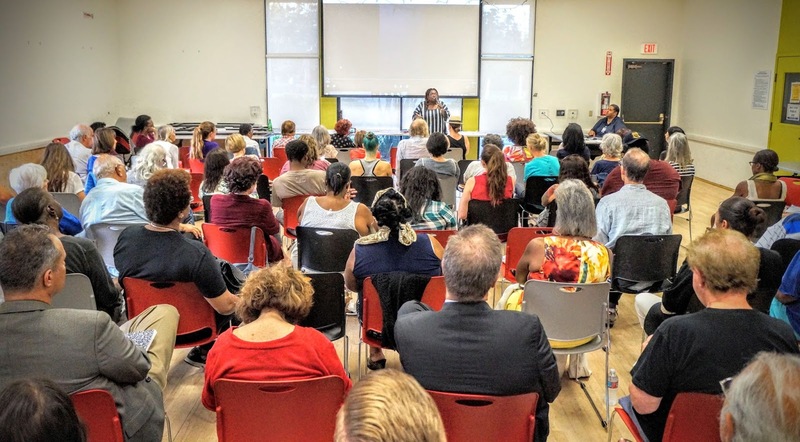 On the local level CRJ, along with the Santa Monica/Venice chapter of the NAACP, the Westside ACLU and the Peace and Justice Committee of the Santa Monica Unitarian Universalist Church, participates in Coalition for Police Reform. It is the mission of this coalition to eliminate racial profiling, as well as the use of unnecessary force toward Black citizens, by the Santa Monica Police Department. CRJ faces new challenges, seizes new opportunities. CRJ’s July, 2017, workshop was visited by 5 members of white supremacist hate groups, 3of them wearing bandanas as masks. Throughout the meeting they interrupted and made racist and anti-Semitic remarks out loud. 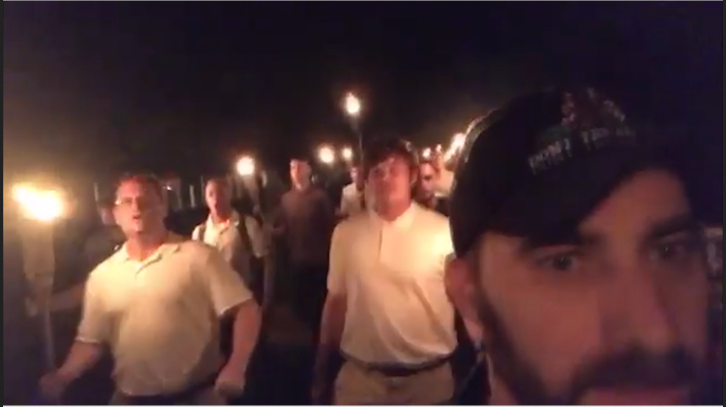 The August meeting was besieged by at least 30 white supremacist disruptors, who tried to invade the hall but were blocked at the door by stalwart attendees. Our research indicated that over 300 neo-nazis were mobilizing to descend on our next workshop. CRJ spearheaded a de-escalation and public safety program for CRJ and its anti-racist allies. Several hundred CRJ supporters turned out for the September 10 workshop. They were fortified by a plan for resistance, the presence of numerous clergy, and a large police contingent. Only a handful of far-rightists dared to show up, and the meeting proceeded peacefully. Not only are white supremacists attempting to disrupt our workshops. They are also spreading misinformation about us. We have therefore taken up the additional projects of safeguarding our workshops and of sharing our message more broadly. We shall not be moved. We are committed to growing and expanding our anti-racist work in Santa Monica and invite others to join and participate with us. In other words, prior to the election of the first black president, the "respect for our Country, Flag and National Anthem," that the Dotard and the other white supremacists are now getting stark, raving mad about was trumped by the "timing concerns for the television networks," and nobody was complaining then. What Trump called the mothers of the players who took a knee, that's what I call DISRESPECT. @TwitterSupport: Will you tell us who was behind these suspended accounts? @TwitterSupport All the twitter accounts I cite in this 2013 post https://t.co/AvmdWm3HEB have since been suspended. Can us tell us why? I know that Twitter officials are talking to congressional Russia investigators today about how Russia-linked accounts were used to influence the US 2016 elections. There is a growing body of evidence indicating that the Russian state, under the control of Vladimir Putin, has been massively using computers to create robots with artificial intelligence, to "people" fake social media accounts to push Putin's agenda around the world. 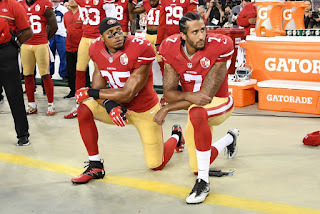 Currently, the focus is on the most recent US presidential election, but we know Russian bots have also been active in recent European elections as well, and are active even today, tweeting on both sides of the #TakeAKnee controversy. Facebook has gotten the most attention. Especially since they revealed the existence of facebook ads paid for by Russians in rubles, including ads supporting the candidacy of Green Party contender Dr. Jill Stein. There is every reason to believe the Russian influences were even more active on Twitter than on facebook, but so far Twitter has not been forthcoming about the details. Some sources have cited Russian bots flooding Twitter promoting Putin's views on Ukraine after the July 2014 downing of the Malaysian Air MH17 passenger jet. I think it may go back even further than that. In July 2013, I was mainly blogging about Syria. At the time the Syrian revolutionaries and their supporters were winning the social media war, especially on Twitter. Then, quite aRuptly, there came a flood of pro-Assad, counter-revolutionary tweets. I noticed this trend and wrote the blog post below about it. Everyone of the 10 accounts I questioned in this blog four years ago has been suspended, not closed and not just inactive. That means these accounts were closed by Twitter for cause. I believe we are entitled to more information than that. If you read the blog post, you will see that in 2013, I assumed these fake accounts were of Syrian origin, since I first struggled against them on the Syrian social media battlefield. Now, I think it is probably safe to assume they were Putin inspired and an example of his support for Assad. The only way to know for sure, however, is to see what these accounts tweeted about since they were created in early July 2013. That is actually what I intended to find out when I went back to the tweets and found the accounts suspended. This is not helpful. While I'm glad these accounts have been suspended, it is important that we still have access to their publicly published content. Like it Never Even Happened! is not a good slogan for a social media company. As long as the content is not pornographic, it should still be made available with a warning about why the account was suspended. 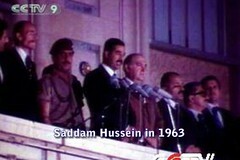 To begin with, these now suspended accounts helped to keep a brutal fascist dictator, Bashar al-Assad, in power. They should not be simply "disappeared" after having done that. Who knows what other damage they did before they were suspended? Twitter knows! They should not keep this info to themselves. They should make a full accounting. When Twitter reveals what it knows about these accounts and why they were suspended. I will report it here. Please Re-tweet this article until they respond. What's up with these Tweets? 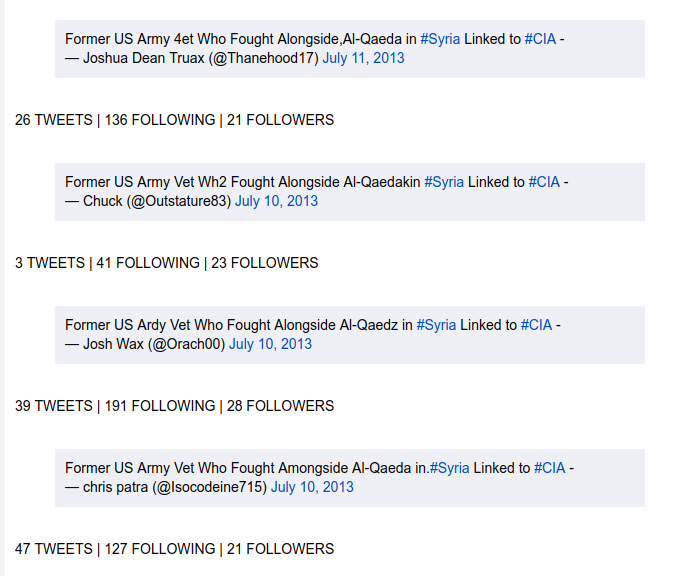 "Former US Army Vet Who Fought Alongside Al-Qae'a in #Syria Linked to #CIA"
For about a week now my twitter feed filtered for #Syria has seen this same tweet repeated over and over with no link or not a usable one for more info. All of these tweets are worded very closely if not exactly the same, which would seem to indicate some unity between them but they are all from different accounts. I took a look a some of these accounts and I found an interesting thing. All of these accounts were very new. 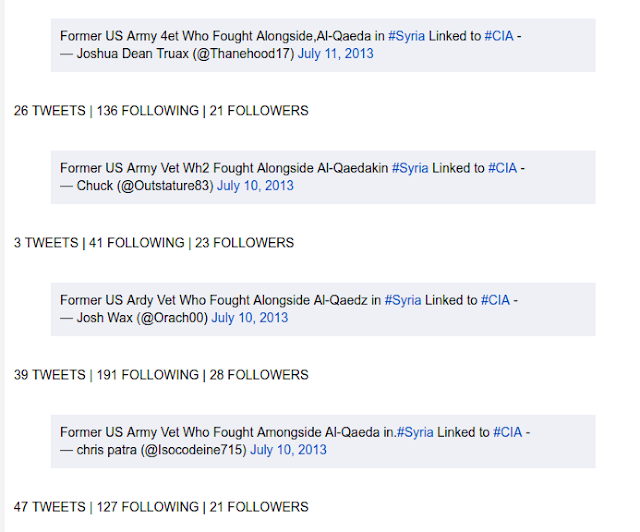 Most appear to have been started on 2 July 2013, most have only a few dozen tweets and a dozen followers. Most interesting is that this tweet appears to be the only one from these accounts on #Syria although it may have repeat this tweet a number of time. Most of the other tweets make no sense. Which is a tweet that also shows up in many of these accounts. 23429 How many ProhBowlers have played alongside Sam B2adford on offense? I could go on and on, but you get the picture. I have looked at many more of these tweets and the accounts that made them than I have listed here and I have found exactly the same pattern. They go back to 2 July and none of the accounts I have looked at have more that 50 tweets and 30 follower, all have this lone tweet on #Syria, often repeated, but no other tweets about #Syria. Curious. I strongly suspect that something very nefarious is going on here, like a robot invasion, and given that this one tweet ties them all together, I have to strongly suspect that it is the Assad Regime, or its supporters that are behind this. In any case, I feel that we need to know what really going on here because it feels like somebody is trying to subvert social media big time. Having now watched the first five episodes of "The Vietnam War" as told by Burns & Novick, I find it a very detailed and sophisticated effort to normalize our collective history of the Vietnam War in such a way that even while we recognize the horror that it was, we feel no collective responsibility for it. Its mission is to prepare the US public to support future US wars wherever in the 3rd world the US may next conduct them. Vietnam need not worry this time; Korea, Iran and Venezuela should be concerned. Its mission is to create a national consciousness about the Vietnam War in which we can look back and see ourselves as "the good guys," flawed perhaps, but still "the good guys." Ken Burns want us to believe that the "better angels of our nature" were still at work in the Vietnam War. To sell this mythology they have to obscure or avoid two important aspects of the Vietnam war story that fly it the face of this good guy image. The first is the sheer meanness and racism of the way the US conducted the war. For 30 years it thought that killing more Vietnamese was the answer. I addressed this aspect in my first blog post on this series and in my film Vietnam: American Holocaust. The second is aspect I expect this series to continue to avoid is the hint of any larcenous motives for the US war in Vietnam. 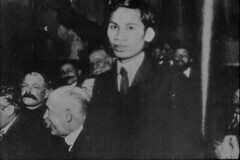 The motives so far presented are a need to fight communism and a desire to support an independent South Vietnam. These are presented as honestly felt motives even if they latter proved not to be all that. It is nowhere suggested that the US was in it for the money. The image of the United States during Vietnam War is one of an economy that was going well in spite of the burden of the war, when actually it was the other way round; the US economy was doing well precisely because of the war. The bottom line truth is that US capitalism is addicted to war. The boom times of the '60s required a US war somewhere. It was just Vietnam's turn. Near full employment at home required up to half a million Americans working abroad killing gooks. While an economic and political analysis of why this feature of advanced monopoly capitalism is so well established is beyond the scope of anything I will present here, the temporal relationship is easy enough to illustrate. To do that I will here present the first thing that comes up in a Google search for "US recession history," which is The History of Recessions in the United States, and add to it my commentary as it relates the corresponding US wars timeline. My comments are in blue type. The history of recessions in the United States since the Great Depression show they are a natural, though painful, part of the business cycle. Excuse me! They most certainly aren't "natural." Capitalist crises are caused by the economic inequalities of that system, but that is not the only way to do business. The National Bureau of Economic Research defines when a recession starts. The Bureau of Economic Analysis measures recessions using gross domestic product. This recession lasted only eight months (February to October 1945). It seemed to last longer.That's because GDP continued to fall until it reached -10.6 percent in 1946. This was a natural result of the demobilization from World War II. That happened when the huge demand for military weapons fell off. Government spending dropped, although business spending was robust. Source: “Business Cycle Expansions and Contractions,” National Bureau of Economic Research, Cambridge, MA, NBER.). This recession timeline begins after World War II so it doesn't cover the period of the worldwide Great Depression of 1929-1939 or the fact that in spite of all the various government stimulus and social aid programs, it was ultimately the mobilization the for the war that brought prosperity to American capitalism. Amadeo's history of US recessions begins in 1945 with the recession the US economy immediately fell into as soon as war was not the answer to that central question of monopoly capitalism: How do we forestall economic collapse? This 11-month recession began in November 1948. It lasted until October 1949, when unemployment reached a peak of 7.9 percent. It was a mild adjustment as the economy continued adjusting to peacetime production. There was a lot of pented up consumer demand right after the war, but that only carried the economy so far. In less than four years without serious war spending it found itself back in recession again. It's no accident that 1948-1949 saw the rise of the Cold War and its attended arms race. According to www.us governmentspending.com, the US defense budget, which had been as high as 41% of GDP during WWII, had dropped down to 7.2% of GDP by 1948, and the country started going into recession. Cold War and Korean War spending pushed the defense budget to nearly 15% of GDP, and it starved off recession again until that war ended. This recession lasted ten months (July 1953 - May 1954). It resulted from the demobilization after the Korean War. Unemployment didn't reach its peak of 6.1 percent until September 1954, four months after the recession ended. GDP contracted 2.2 percent in Q3, 5.9 percent in Q4, and 1.8 percent in Q1 1954. As soon as the Korean War ended, US capitalism began to falter again. The Fed's contractionary monetary policy caused it. Actually, the lack of war caused it, although there was never a total lack of war. In this period the US was already paying for about 80% of the French war in Vietnam, and there were always other military expenditures. They just weren't enough to keep the economy humming along. The contractionary monetary policy was a vain effort fix an inherently broken system with monetary patches. Since the end of the Korean War the economy had been troubled, it would take the Vietnam War to deliver the next decade of prosperity. It would be a prosperity paid for by blood, 98% Vietnamese, 2% American. Starting in April 1960, the recession lasted 10 months, until February 1961. GDP was -1.5 percent in Q2, rose 1.0 percent in Q3, but was -4.8 percent in Q4. Unemployment reached a peak of 7.1 percent in May 1961. President Kennedy ended the recession with stimulus spending. His opponent, Richard Nixon, said the recession cost him the election. That's because he had been Vice-President so voters blamed the Republicans for causing it. This economic survey doesn't delve into what Kennedy's stimulus spending was for. Much of it involved the startup costs for America's direct involvement in Vietnam. It would prove to be just a small down payment for the billions in "stimulus spending" that would use the Vietnam War as its justification and keep the US economy humming along for the next decade. This recession was relatively mild, lasting 11 months (December 1969 - November 1970.) GDP was -0.7 percent in Q1, then rose 0.7 percent in Q2, 3.6 percent in Q3, and fell 4.0 percent in Q4. Unemployment peaked at 6.1 percent in December 1970. The war was wining down and already the effects were being felt. Certainly, Arabs asking a fair price for their oil makes for an easy target, but without a doubt the biggest "contributing factor" to this two year recession following the end of US direct involvement in the Vietnam War was the lack of war to "stimulate" United States capitalism. It would stay in the doldrums until Reagan brought it back with a fresh round of military spending. Now, Trump, who ran as a non-interventionist candidate, has ramped up existing wars in Afghanistan, Iraq and Syria, and is looking to start a big new one somewhere soon, while he brags that the anticipatory stock market is at an all time high. This is the ugly. ignoble truth about US wars, both now and then. Let's see if Burns & Novick even touch on it in week two. Ken Burn's Vietnam Revisited: This was no Civil War! When I say that the Ken Burns and Lynn Novick documentary epic "The Vietnam War" is no "Civil War," it has a double meaning. 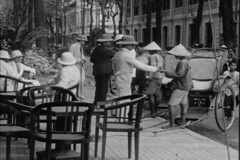 First, as a documentary film and a work or art, it doesn't hold a candle to that seminal work by Ken Burns, The Civil War, but most importantly, the American War, as the Vietnamese refer to it, was a war of independence and not a civil war, as Ken Burns seeks to frame it in his most recent piece. Of course, in every war of independence, without exception, you will find some indigenous people that take the side of the colonial masters, so there is always room to frame the struggle as a civil war in which the great power is merely assisting one side, and the great power can generally be counted on to frame it that way. 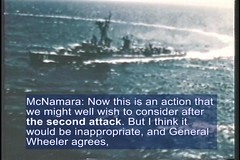 That must be behind the documentary's early assertion that US involvement began in good faith. That is put out there without any proof and backing as though it is beyond dispute. Absent is any discussion of the requirement that the United States periodically make war somewhere just to maintain what we call a "healthy economy." It's no secret to serious students of US capitalism that it was really the arms buildup for World War 2 that finally dragged the economy out of the Great Depression. It started to slump again as soon as the boys came home looking for jobs. Even post war domestic requirements were insufficient to keep things humming and everyone employed, so they hyped the so-called threat of communism and created a new arms race. They also staged two major hot wars, Korea and Vietnam, that were very profitable for the capitalists as a whole, not just the arms merchants, and very good to the US economy. Its no accident that when the Vietnam War ended, the US economy fell into any extended slump that didn't end until Reagan greatly stepped up military spending again. This is an economy addicted to war, which is why it is looking for another one now in Korea or Iran, perhaps Venezuela. Somehow it is considered okay to kill combatants, as though anyone who exercises a right to self-defense or rises to defend their homeland is fair game. South Vietnam was a French/American creation and the ARVN was paid by the US government so it could claim it was supporting one side in a civil war. There is good reason to hold the United States responsible for the vast majority of the deaths on both sides after 1962. So roughly three million Vietnamese were killed, overwhelmingly by US military might, and that didn't just include those bombed by B52s, it included children killed for sport by GIs riding around in trucks. We waged a very mean war. A My Lai every week. The Vietnam War was a very racist war as it was conducted by the Americans. So far, in episode 1, this piece has done a very good job of hiding that fact. The United States didn't see itself as killing more than three million people in Vietnam, it saw itself as killing more than three million "gooks" in Vietnam, and that made it okay. If that word got mentioned even once in episode 1, I missed it. In anycase, the Vietnam War was carried out in a very racist manner in the way the Americans treated the Vietnamese on all sides and this so far hasn't even been hinted at. This may be were this piece performs its greatest disservice, given that we now have a white supremacist president that is picking a fight with another Asian country. At every turn it seems to let the imperialists off the hook for this thirty year tragedy. The French took revenge by committing atrocities. Revenge for people standing up for their freedom no doubt. Truman inherited a very different world than Roosevelt left, to explain their different approaches to the Vietnamese liberation struggle. Did that much change overnight? The communists were every bit as ruthless as the French. Now that the communists have ruled Vietnam for a few decades, we can compare the treatment of the people under the French and under the communists and see the full extend to which Burns and Novick are willing to distort the facts. "History will judge whether the war was worth the sacrifice." No, the Vietnamese people have already decided that independence was worth the extreme costs we imposed. 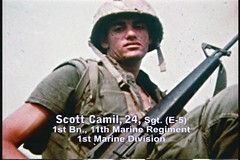 And so is went in episode 1, endings with a salute to American bravery - Yes, the American soldiers in Vietnam were brave. So were the French soldiers that fought to keep Vietnam in imperial chains before them, and the Japanese soldiers before them. They were brave when they savaged Vietnam, raped Nanking and bombed Pearl Habor. Bravery is shown on both sides of a civil war, but again this was no Civil War. 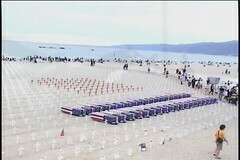 Ordinary soldiers ordinarily show extraordinary courage for very despicable causes. It is important that we remember that as this film celebrates American bravery in Vietnam. 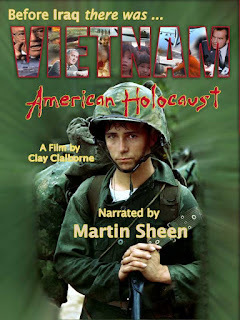 You may purchase your very own copy on DVD from the movie website: VietnamAmericanHolocaust.com or alternately, from Amazon. Today I also discovered that it is available for bittorrent download, which kinda makes me feel like I've arrived. [Anything worth stealing is worth something.] But you don't seriously expect me to tell you how to find that. In fact I am now seriously considering dropping my opposition to the Copyright Infringement Bill and reversing everything I have said on that subject. NOT! BTW, these people are obviously well funded. As I publish this, Vicent James and the Red Elephants are Live Streaming the "pro-Trump" MOAR in Washington, DC this morning. 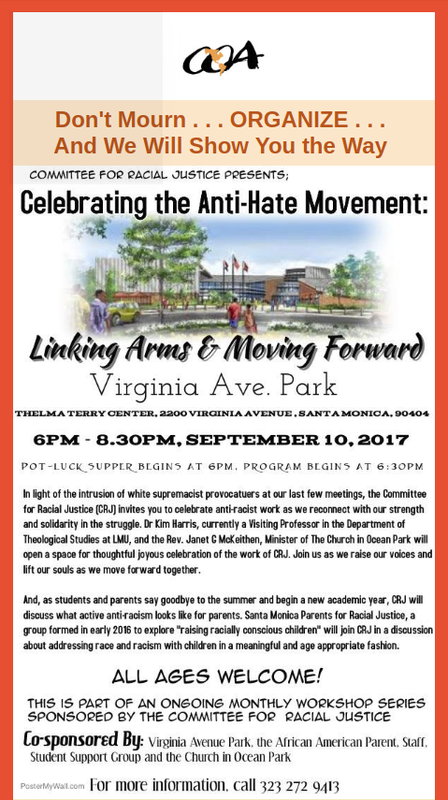 Santa Monica Committee for Racial Justice needs you this Sunday! As this picture shows, these racists brought their foul stench to the July meeting. They came to broadcast their dislike for African Americans, Jews, immigrants, in fact all of humanity. They acted like children, blurting out misplaced statements, and holding up misspelled signs. 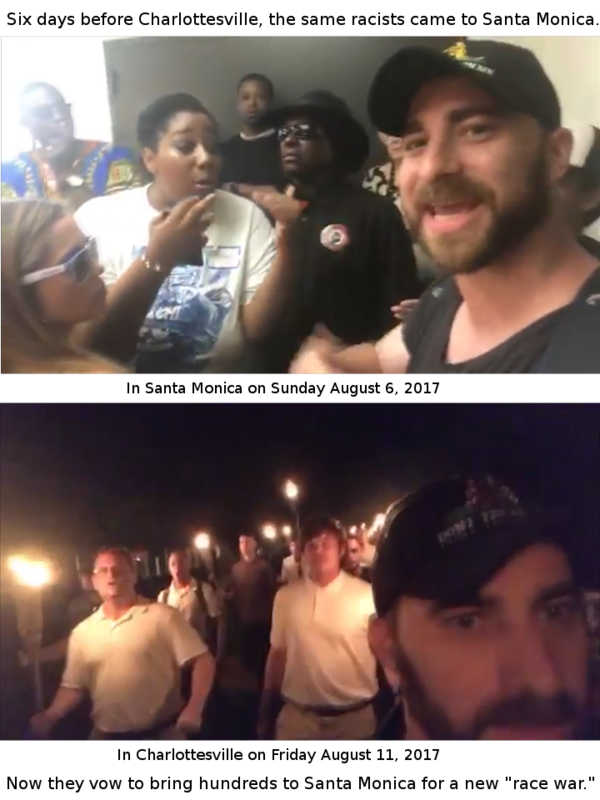 In August some of the leaders of this Santa Monica assault marched with the plainclothes Nazis and Klansmen in Charlottesville. The week before they went to Charlottesville, they again tried to invade the Committee for Racial Justice meeting. They did not succeed. Although they came with much greater numbers to the August meeting and tried to bully their way into the meeting, the committee members were able to fight them off and go forward with the meeting as planned. In their anger and frustration, they promised to return in September with "hundreds." They vowed to "shut the meeting down." They said they were going to make Santa Monica their new "Berkeley." The CRJ Steering Committee responded by making a broad call to the progressive public to come to Virginia Avenue Park and show their support for the anti-racist struggle by their numbers, and the community responded. The Santa Monica community really turned out, even the Mayor was there, and activists came from as far as San Diego. It was us that came with hundreds, maybe as many as a thousand. Our security reported that a group of plainclothes neo-Nazis were lurking a few blocks away, and a few people thought they saw a red pink elephant scouting the park early on. No doubt, when the racists saw what was waiting for them, they beat a hasty retreat. Racial Justice Won the Day! We had a very successful meeting with a packed room while hundreds of supporters celebrated in the park. The Santa Monica Police again showed up in large numbers. I never knew they had a cavalry before! They also brought in help from the sheriff's department and from other local police departments as far away as Alhambra, but they were unneeded. We, the people, had the situation well under control. Here is the CBS News report on the meeting. Notice that they used my footage of the July and August meetings, without either credit or permission, I should add. "We only shoot black people"
When Lt. Greg Abbott told the white woman he arrested for DUI "We only shoot black people," he wasn't cracking a joke or being sarcastic. He was seriously trying to comfort this woman by clarifying a police lieutenant's understanding of a police policy that has been obscured by the mainstream media. This was only days after the police murder of Philando Castile had been livestreamed on facebook by this girlfriend. That video then made its way to a mainstream media so intent on denying the racist nature of the killing that this white woman could conclude the police treat everyone that way. Abbott was telling her not to worry. They don't kill white drivers for no good reason. Unlike black lives, white lives matter to police. The date stamp on the video is July 10, 2016 — just a few days after Minnesota police shot and killed Philando Castile, whose girlfriend recorded his death with her phone. Channel 2 Action News first reported the existence of the Abbott tape in its newscast Wednesday night. The footage shows the officer speaking through the car window to a female passenger in a vehicle that had been stopped for suspected DUI. The woman tells Abbott that she is afraid to reach for her cellphone because “I’ve just seen way too many videos of cops ... ” At that point, Abbott cuts her off. This wasn't being said by some rogue rookie. Abbott was a Lieutenant, high up in the command staff and a part of department management. He had been with the force for 28 years so he certainly was in a position to know what department policy was on the ground. Why did Chief Register decide to fire Abbott only after the video became public? He knew about it earlier. Suri Chadha Jimenez, the driver's lawyer in the DUI case saw the video while preparing the case. A good attorney certainly would have brought it to the attention of the department if only to cut a better deal for his client. If Register wasn't aware of it then, we became aware of it when WSB-TV made the FOIA request. Apparently Abbott's statement was acceptable to the chief but the chief knew it was unacceptable to the public. That is why he had to go now that it became public. Chief Mike Register needs to clarify just what mistake he thinks Abbott made. Was his mistake that of making such a blunt statement about the homicidal racism of his police department, or was he mistaken to think that was department policy? Since Abbott was a ranking member of the police force, as a lieutenant he was high up in the chain of command and a part of management, and Register was his supervisor and "known [him] for years and perceived him as honorable," No matter how Chief Register answers that question he needs to resign if he is to be perceived as honorable. Register showed that his concern was for the statement Abbott made on tape and not the reality behind it or even Abbott's perception of that reality, if they thought it was wrong. The mistake he made, as far as they were concerned was saying it outloud. Chief Register would say at the press conference. “There is no place for those types of comments." It isn't clear just when Chief Register and Commission Chairman Mike Boyce became aware of Abbott's comments of July 2016, but the day after WSB-TV aired it they held a press conference to denounce this revelation and announce their intention to fire him. It remains to be seen if this will come to pass. Even as they were making their announcement, Abbott was sending an email announcing his retirement. Even though I despise Abbott, I recommend he get a new attorney. This one is clearly incompetent. In the first place nobody was trying to arrest a "passenger" for DUI, in the second place, the driver, who was the only one in the car, never brought up race, Lt. Abbott did that. LoRusso is right that he did this to de-escalate the situation and gain her compliance. He was trying to do that by making it clear to this white woman that the wave of police killings that so unnerved her was part of a genocidal policy that targeted black people, and so she didn't have to worry. LoRusso also turned up as the cop's attorney in at least one other recent case that brought charges of racism to the CCPD. On 6 November 2016 ex-Cobb County officer James Caleb Elliot fired eight shots at a 16-year-old after the cop caught him and three others in a stolen car. The car had been stolen 3 days before, so there was reason to believe the four teenagers inside weren't the violent felons Elliot would later claim he thought they were. He ordered the teens out of the car and knew that they were unarmed. When one of the teens ran away, Elliot went after him with his gun blazing in this residential neighborhood. He fired eight shots and hit two houses before he bought down the youth with a bullet in the leg. Technically Elliot had resigned two days before, so this may have been something of a parting shot. But Lt. Greg Abbott sent an email to the county announcing that he plans to retire, even as the police chief was on live television saying Abbott would be terminated, according to Commission Chairman Mike Boyce. Boyce said he was unsure how that development would affect the decision to fire the lieutenant. Cobb County Public Safety Director Samuel Heaton said 1 September that Abbott will be allowed to retire and by doing so he will escape any disciplinary actions. Apparently, this is what they do with racist cops once they have been "outed." They are allowed to retire with their pensions. Cobb County Police Department was investigated for racism last year after this same cop was accused of harassing Cobb County Commissioner Lisa Cupid, who is African American. She filed a seven-page complaint with the county police in 2012 after Elliot, who was working undercover, followed her into her subdivision late one night. The Cobb County Board of Commissioners responded to these incidents by paying the the International Association Chiefs of Police $93.000 for a police policy assessment of the county’s police department. The study pointed to a histpry of racial profiling in Cobb County. The real tragedy is this happened OVER A YEAR AGO. Some reporter went back in time to dig up old footage using the FOIA to smear a decent police officer who was only being sarcastic. Damn. Now ANYTHING you have said in your past will come back to haunt you if a reporter wants to smear you just so they can get a news story out of it. THIS is why America hates MSM. Sarcasm is a form of humor and there was nothing funny about this. When I first heard the abbreviated version of this story on the CBS Morning News, I thought sarcasm too, but then I assumed he was talking to a black person. Once I heard the fuller version and learned those words were directed towards a white suspect, and that it was the white cop, not the white DUI suspect that interjected race into the event, those claims of sarcasm seemed baseless. Merriam-Webster defines "sarcasm" as humor "designed to cut or give pain" and "is usually directed against an individual." So if this was sarcasm, was the woman the target? She was the only other person there. Why would he think that bringing in race would help him hurt her feelings? "Sarcasm" is the universal explanation of all the racists that support for this cop. Which is not so say that everyone who says the cop was being sarcastic is a racist, just that this is the explanation put forward by those looking to excuse his behavior. Only Abbott knows if he was even trying to be funny with these comments, and while we haven't heard directly from him on that score, we have heard from his mouthpiece, his lawyer. His lawyer says Abbott was trying to "de-escalate a situation" and "gain compliance." In other words, he wasn't trying to be sarcastic at all. That's why he never gets to the punchline. He really was trying to take away her fear by pointing out to her that she was privileged not to be subjected to the same level of police violence as African Americans. Los Angeles, CA - In light of the intrusion of white supremacist provocateurs at their last two meetings, the Committee for Racial Justice (CRJ) on September 10th will celebrate their anti-racist work and reconnect with their strength and solidarity in the struggle. As the world watched the hate unfurl in Charlottesville, VA, CRJ resolved to stand boldly on the side of resilient love and against divisive hate. The CRJ meeting will be held September 10th at Virginia Avenue Park, Thelma Terry Room, 2200 Virginia Park Avenue, Santa Monica. The meeting will begin at 6:00 pm with a potluck dinner and the workshop will start at 6:30 pm. Dr. Kim Harris, currently a Visiting Professor in the Department of Theological Studies at LMU, and the Rev. Janet G McKeithen, minister of The Church in Ocean Park will open a space for a thoughtful joyous celebration of the members and work of CRJ. “Dr. Harris will bring songs that kept enslaved people linking arms and moving forward, as we today strengthen our resolve to do the same,” said McKeithen. “CRJ encourages the public to join us as we raise our voices and lift our souls as we move forward together,” she said. And, as parents and students say goodbye to the summer and begin a new academic year, CRJ will discuss what active anti-racism looks like for parents. Santa Monica Parents for Racial Justice, a group formed in early 2016 to explore "raising racially conscious children" will join CRJ in a discussion about addressing race and racism with children in a meaningful and age-appropriate fashion. This is part of an ongoing monthly workshop series sponsored by the Committee For Racial Justice. Co-sponsored by Virginia Ave. Park; the African American Parent, Staff, Student Support Group; and the Church in Ocean Park. Get the latest updates from the CRJ facebook page. A Santa Monica community group focused on addressing racial inequality has been targeted in recent months by increasing numbers of individuals espousing racist and anti-Semetic rhetoric. 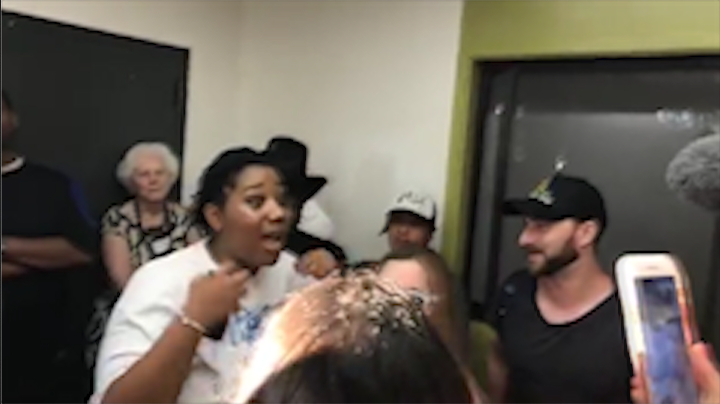 The issues began in July, when a workshop titled “White Privilege and What We Can Do About It,” organized by the Santa Monica Committee for Racial Justice, at the Virginia Avenue Park community center was interrupted by five people. Video shows those five — three of whom kept their faces covered with bandanas — making hate-filled comments during the meeting. A month later, there were about 50 such people, committee organizers said. Video footage compiled by local blogger Clay Claiborne, who attended the event, shows the outsiders arguing with and taunting meeting-goers outside of the community center. Later, they are shown trying to force their way into the meeting and being blocked, first by the attendees and then by police. The committee’s next meeting will be at 6 p.m. Sept. 10. It will focus on raising racially conscious children. The Committee for Racial Justice formed six years ago. The Rev. Janet McKeithen, a member of the steering committee, said the group was created by members of the Church in Ocean Park, an interfaith congregation in Santa Monica. Since then, it’s expanded to include community members from outside the church who come from a variety of backgrounds and faiths, she said. Today, the committee holds monthly workshops at the Virginia Avenue Park community center. Workshops, which typically draw about 50 people, focus on educating the community about racism and devising ways to address it in the education and criminal justice systems, she said. The city of Santa Monica allows the committee to use the community center free of charge but does not provide any funding. Workshops are open to the public, McKeithen said.